Select RS for a sealed bearing , has two contact rubber seals one on each side of the ball bearing. 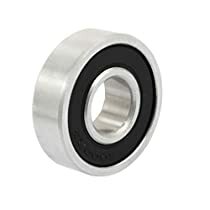 If your application requires a 6000RS ball bearing with only one seal you can get this ball bearing and take one of the seals off. Internal Diameter : 10mm/0.4";Outside Diameter : 26mm/1"